The Superstar and Shankar combination is back! After Linga's not so good experience, the actor is now ready to give another block buster with Shankar. There were lot of rumours around Superstar's next with top directors from Kollywood. Well, here is an exclusive scoop. There were reports that both Rajini and Kamal will be coming together for Shankar's new project produced by Lyca International. 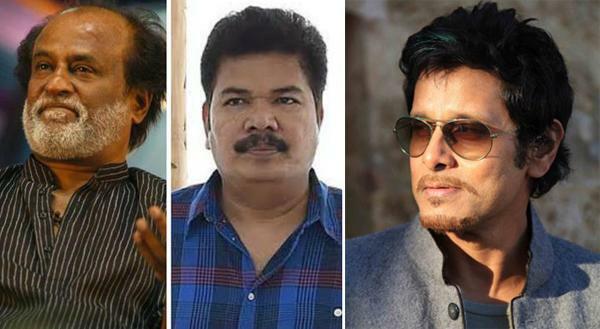 Actually we learn that Shankar has written the script for a multi-starrer with Vijay and Vikram, later as Rajini wanted Shankar to direct his next film, the entire plan has been changed. If Rajini should reprise Vijay’s role, Shankar had a thought of roping in Kamal Haasan as another hero. Reportedly, Shankar and Lyca have approached Kamal through Ayngaran Karunamoorthi but the actor is said to have reportedly turned down the offer. But after much consideration, Shankar decided to go back to his favourite Anniyan Vikram. Remember Vikram is a Shankar favourite and has already done two films together. There were rumors surfacing that the mega combo of Rajinikanth - Shankar is likely to strike again with yet another trendsetting film. They joined hands for the first time in the year 2007 for the commercial extravaganza Sivaji which shattered box office records, and later went on to garner ultimate box office glory with the sci-fi entertainer Enthiran. We now have reports from authentic sources that the combo is indeed getting back for another film with a grandiose budget of close to 250 crores. Sources add that the shoots are likely to begin in about 4 to 5 months' time. According to the reports, the film in question will be produced by the makers of action-thriller “Kaththi”. It is worth mentioning here that "Kaththi" had broken the record collection of Rajinikanth, "Sivaji" and also created history in the U.S. where the film garnered over $600K. The ageing actor, Rajni, will be eagerly waiting for a good release as his previous two movies were a huge disaster at the box office. His mega budget movie "Kochadaiiyaan" and "Lingaa" did not live up to the audience expectations. Well, it remains to be seen if the upcoming movie will turn the tide in the favor of the super star. Rajinikanth is said to be fit and healthy of late, justifying the popular dialogue from Padayappa ‘Vayasanalum un style'um un azhagum innum unna vittu pogala’. With the Superstar and Shankar joining hands again, a lot is at stake and Enthiran’s box-office records would be the minimum benchmark. Official confirmation on the cast and crew is awaited. A little birdie tells us that it is not a sequel to Enthiran as everyone is speculating it to be. Just like any other Shankar film, this film is expected to be made at a lavish budget and is expected to be shot ar exotic locales across the globe. The makers are looking for a Bollywood babe to be paired opposite Rajini even this time around. AR Rahman is supposed to be the in charge of music department. Will Vikram say yes to Shankar’s offer? Will we see Rajini vs Vikram battle on big screen next year? We are eagerly waiting to see what Vikram has to say to Shankar’s offer. Like any excited fan, even I hope to see Vikram taking on Rajini on big screen very soon.